Funny how the first thing I write about post honeymoon isn’t some tropical drink or dish (though those are coming some time soon), but about pasta with a somewhat obscure name – fregola sarda. From Jamaica to Sardinia in one fell swoop. How’s that for globetrotting? Fregola sarda’s name hints at its origins, the island of Sardinia (hence “sarda”). It’s sometimes spelled as fregula and even though it’s a little tricky to find, I can’t recommend it enough. Visually, it looks just like Israeli couscous, which you can certainly swap in its place, should its Sardinian cousin be difficult to find. The only difference that I can think of (and please correct me if I’m wrong) is that fregola sarda is toasted, which gives the pasta a lovely, nutty flavor, while Israeli couscous is not. 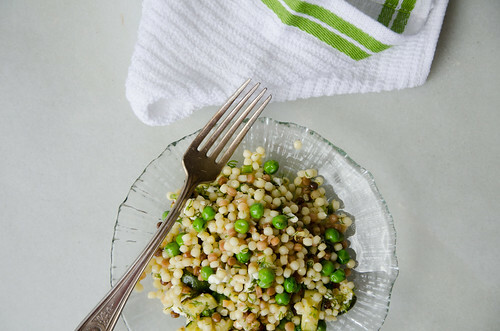 Curious, I’ve tried toasting Israeli couscous and it makes for a decent close substitute. Going grocery shopping after being away and coming home to an empty fridge is an adventure – you wind up walking out with so many bags. Rummaging around Sunday morning, after getting home late Saturday night, I found a dried-up carrot, a moldy lemon, and a bruised, mealy (as it turned out) apple. Elsewhere in the fridge, there was jars of mustard, anchovies, harissa, mayonnaise, capers, pickled ramps from last year, preserved lemons, homemade sauerkraut I’ve been aging for soup, and (obviously) some kimchi. All lovely ingredients, but outside of midnight pasta, one of our favorites, nothing that could make any kind of a meal. What we needed were fresh vegetables, fruit, herbs. Some dairy, too. In our neighborhood, where we are now (and are very lucky with our grocery options), we have to make several stops to get what we need. There’s a lovely butcher for meat, our fishmonger for fish, a few inexpensive produce stores where we can find excellent vegetables and (for this season) decent fruit, a bakery for our bread. But this means many different trips and quite a bit of time. Still, we take it in strides, grateful for our options and their relative proximity. We treat it as a fun excursion rather than errands, and it helps, at least, in our head. If only. But it’s quite possible, that then I’d be too tempted to sneak out and play hooky at the beach. I mean, just look at it – wouldn’t you do the same? This is a great dish that you can make in advance and keep on hand for an easy lunch, potluck, or picnic. Keep some lemons on hand to drizzle over the salad if serving it later, as well as some more olive oil as both tend to get absorbed by the pasta. 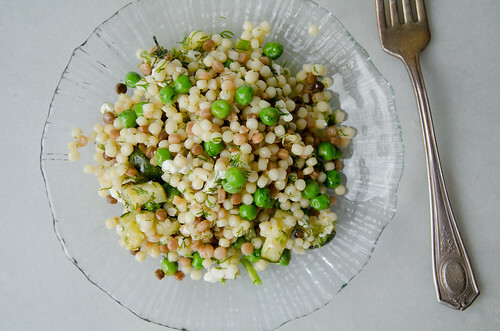 As I wrote in the write-up above, you can swap in Israeli couscous (which you can opt to toast, if you like) should fregola sarda prove hard to find. However, if you’re willing to go the extra mile and procure it, it’s totally worth the extra effort! It should go without saying, but the herbs and vegetables are totally optional. Hate peas but love favas? Not a fan of dill but prefer a cool hint of mint (oops, I didn’t mean to rhyme that)? Or both dill AND mint together? Do whatever you want – make this salad truly yours! 1. 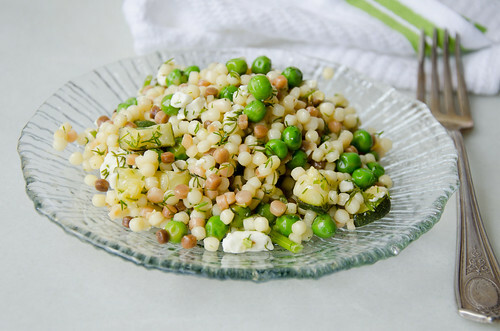 Bring a medium pot of generously salted water to a boil and blanch the peas for 90 seconds. Drain (reserving the water) and transfer the peas to an ice bath. Let cool and drain. Set aside. Chop the zucchini and transfer it to a strainer set over a bowl. Sprinkle with a few pinches of salt and mix to combine. Let the zucchini juice drain into the bowl. Set aside. 2. Return the reserved water back in the pot and bring to a boil again, add the fregola sarda (or the couscous – for that you will need to measure water according to the instructions) and cook according to the packaging instructions, or until al dente. With fregola sarda, it took about 7 minutes. Taste regularly to determine doneness. Drain the pasta (or if using couscous, cook until water has been absorbed) and set aside, allowing it to cool to room temperature. 3. While your pasta cools, heat a medium pan over high heat for 3 minutes. Add the grape seed oil and heat it another minute until almost smoking. Add the drained zucchini and let cook in a single layer, without moving, for 3 minutes or until the bottom is medium-brown. Stir and cook another 30 seconds. Remove from heat and transfer to a large bowl to cool. 4. Once zucchini is cool, add the cooled pasta, peas, dill, almonds, and feta. Toss to combine. Add the feta, dill, almonds, lemon zest and juice, and enough olive oil that you can taste its flavor in your salad. I add between 1/4 and 1/3 cup depending on the type of oil I am using and how intensely flavored it is. At the end of the day, there’s no right or wrong here. You can add less or more oil depending on your preference. Taste and season with salt and pepper according to taste. Because you blanch the peas in salted water, cook the pasta in the same salted water, and use feta, you want to avoid adding salt until the very end. Would quinoa work in this recipe? Carla – of course, you can swap in whatever you like, but it’ll be a different texture and flavor.